Visit the exotic land of Bali and combine your beach stay with The Chedi Club Tanah Gajah, Ubud, Bali and you will experience the contrast between a coastal stay and a more authentic Balinese village life. As the Ubud area is elevated temperatures can be slightly cooler than down on the coast but being just 10 minutes outside Ubud you not only will have local shopping and dining to hand but you will be able to indulge in some pure escapism at The Chedi Club Tanah Gajah, Ubud. Dotted around the 5 hectare exclusive estate are 20 villas offering privacy and calm. Paddy fields continue the resorts lush greenery into the distance and the peaks of Mount Agung frame your picture of space and tranquility. 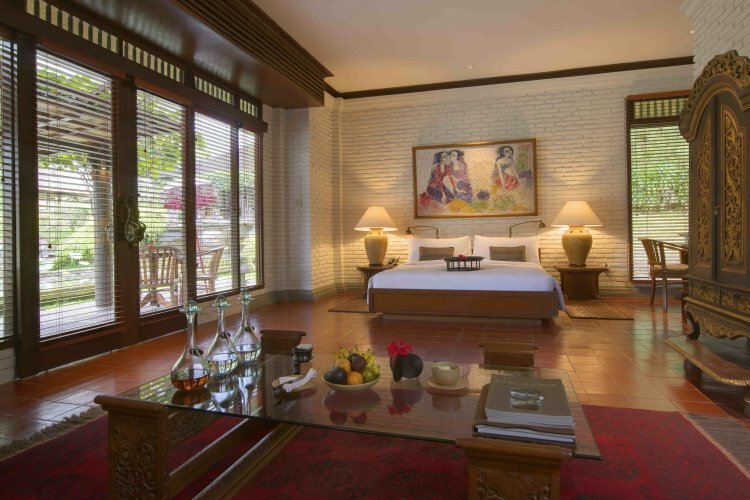 Elegant, charming and romantic are a few words that you will use to describe The Chedi Club Tanah Gajah, Ubud, Bali. Whether you are looking for a romantic stay for your Honeymoon, or simply somewhere to combine local Balinese village life with a boutique stay then this hotel will not disappoint.